European Import Version of Genesis' Documentary, Sum of The Parts, Available for Pre-Order! You can now pre-order the European import version of new Genesis video documentary, Sum of The Parts. As seen on Showtime in the United States and BBC 2 in the UK, the new 2014 documentary includes the participation of many Genesis members and related musicians past and present including: Tony Banks, Phil Collins, Peter Gabriel, Steve Hackett, Mike Rutherford, Anthony Phillips, Daryl Stuermer and Chester Thompson along with additional commentary by others. Please verify that your machine plays European compatible discs before ordering! The North American version is set for release January 13, 2015 (pre-order coming soon). You can now watch part one of a four part Anthony Phillips retrospective interview as part of the launching of his reissue campaign with the label. Part one focuses on his Genesis years and his overall work as a musician and composer. If you haven't already purchased the new Anthony Phillips Harvest of the Heart box set (which includes 10 non-album cuts including Mike Rutherford's non-album cut, "Compression"), you can also enter a competition to enter to win a autographed copy of the box set from direct from Cherry Red and Anthony Phillips! Musician Paul D'Adamo announced that he is in the final stages of completing his forthcoming release, Rawfully Organic, featuring several noted musicians including Jerry Marotta and Tony Levin (known for their work with Peter Gabriel), Trey Gunn (King Crimson) and Billy Sherwood (Yes). The album, which is being recorded at Dreamland Studios in upstate New York, tentatively includes four original songs and seven cover tunes including Peter Gabriel's "Wallflower", "Games Without Frontiers", "Kiss of Life", a barbershop quartet version of "Don't Give Up", as well as Genesis' "Back in NYC" among others. No release date has been confirmed as yet, but more will be posted here when a pre-order and a release date is confirmed. You can also get more information on the release at Melodic Revolution Records. D'Adamo hopes to tour in support of the release in 2015. The Peter Gabriel Encore Series will be available for the winter leg of Peter’s Back to Front European tour that takes to the road during November and December 2014. Genesis' debut album, From Genesis to Revelation, will be reissued on (limited run) vinyl LP by Varese Sarabande as part of Record Store Day 2014, which takes place on November 28, 2014 at independent record stores. To see the full list of Record Store Day 2014 limited editions and goodies to buy, click here. Enter the Exclusive World of Genesis R-Kive Contest! Enter For Your Chance To Win CD and T-Shirt! Genesis fans! World of Genesis is proud to announce a new contest around the release of Genesis' new 3-CD compilation, R-Kive. One lucky winner will receive an exclusive PROMO Genesis t-shirt (size large) and a CD copy of the new Genesis R-Kive album! To enter the contest, simply visit the U Discover site and read this article about the R-Kive album. After reading the article, answer the three questions below (hint: All of the answers are in the article). You can e-mail your responses to: negrindr@hotmail.com with "Genesis R-Kive Contest" in the subject line. Please note that this contest is open to anyone (void only where prohibited by law). No purchase necessary. Only one entry per person. The contest ends Friday, November 21, 2014. Only those who get all three questions correct will be considered. 3. What Genesis song from their 1997 album, Calling All Stations, is featured on R-Kive? Germany’s Federal government will host a celebration at the Brandenburg Gate tomorrow, on Sunday November 9, 2014, marking the 25th anniversary of the fall of the Berlin Wall. The motto for this celebratory gala event will be “Standing up for Freedom”. As part of the announcement it has also been confirmed that Peter will perform his orchestral version of the David Bowie song ‘Heroes’ at the event. A song famously associated with Berlin and originally recorded by David Bowie at Hansa Studios. Read more about the event (including the official press release) here. Reuters reports that Phil Collins, who has brought his vast collection of authentic Alamo artifacts back to San Antonio, Texas (where the Battle of the Alamo took place), will have a new $100 million museum named after him. Collins is a long time enthusiast of the Alamo, and has even released a 2012 book outlining his incredible collection of artifacts that he has amassed over the years as a collector. Steve Hackett Access All Areas Coming This Month! 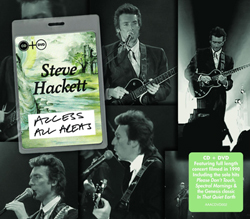 The Demon Music Group will release a new Steve Hackett live album (CD + DVD or vinyl LP) called Access All Areas on November 24th in Europe (no North American date is confirmed yet). Recorded circa 1990 for broadcast on ITV, this release offers remastered audio and video in a deluxe package including extended notes, new interviews, imagery and memorabilia. Please note that as this is a European release, it is unclear at this time as to whether or not this DVD is compatible outside the UK (you may want to be sure you have a multi-region or region-free player before buying this if you live outside the UK if the video portion is important to you. Also note that most computers that can play DVDs are Region-Free). Return to the September 2014 News. Return to the News Index. Go to the News Archive For Older News.